Can I Use the Wooden Dummy to Practice Tecniques? I only know the Siu Lim Tao. Can I use the Wooden Dummy to practice other techniques? I only know the Siu Lim Tao and haven't learned the Dummy form. I've only trained for two years. Answer: You can definitely use the dummy to train all kinds of things, even if you don't know the dummy form. If you have dummy pads, you can use it as a very heavy and sturdy punching bag. I wouldn't recommend hitting it bare-handed on solid wood. Although many people do this. When I was new, the dummy was my favorite training tool to learn and practice the cover punch. Getting the coordination between open and close takes a while for most people. The dummy is a great tool, and much better than practicing this in the air, in my opinion. The lower third arm is great for this, as well as the two upper arms. Also, the dummy allows you to train your cover punches in the left and right stances, or on either side of the dummy. This is nice. By hitting the dummy, especially without pads, you learn which strikes hurt YOU less, but still have a strong force behind them. For instance, hitting someone in the face or head actually hurts you, too. It's not much different than hitting the dummy or hitting a bowling ball. So you learn that maybe a palm strike to the head is better for you, but bad for them (a concussion is a concussion). Or using your forearm in a chop is better than using the wrists or metacarpal bones on the hand. You have less odds of hurting yourself, while still delivering punishing blows to your target. If you hit the dummy with the tip of your elbow-bone, you're going to pay for it. The lower end of your forearm, just below the tip of your elbow joint gets the job done just as well, without potentially disabling yourself. Round kicks using the shins against a bare dummy will knock you down in agony. But front kicks, side kicks, and stomp kicks using your heels (even barefoot) are devastating, and don't put you in unneeded risk of self-mutilation. 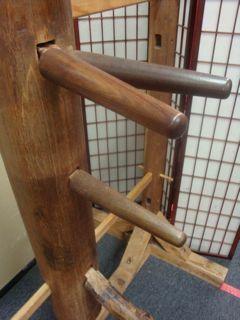 Looking to Buy a Wing Chun Dummy? Check These Out.